When you hear Monkey Knife Fight (MKF), what comes to mind? There is a small probability since I am a sports technology curator for the Sports Techie community blog, you may have guessed daily fantasy sports (DFS) but I doubt it. 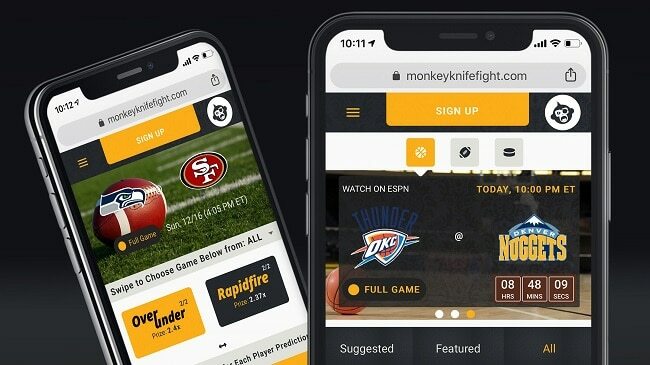 I chatted with Monkey Knife Fight President, Nic Sulsky, about the sports tech startup and their goal of building the best new legal DFS gaming product. Having launched their gaming platform just six months ago for the NFL season, they followed up with the NBA, NHL and PGA, and now MLB. More than 10 million entries have played their football, basketball, hockey, and golf, game of skill contests. We also talked about company owner, Bill Asher, Co-Chairman of Vivid Entertainment, the leading adult content distributors and producers in the industry and his vision regarding Internet-related growth pathways which includes fantasy sports. Users play MKF’s new prop contests against the house not like at DFS sites where professional players use sophisticated algorithms to increase the odds of winning against casual fans or rookies that have little chance to win. With Monkey Knife Fight, fans avoid frustrating salary caps, position quotas, and, as luck would have it, entering against the sharks that rule traditional DFS. Predict sports props and win money. Monkey Fight. Monkey Win. 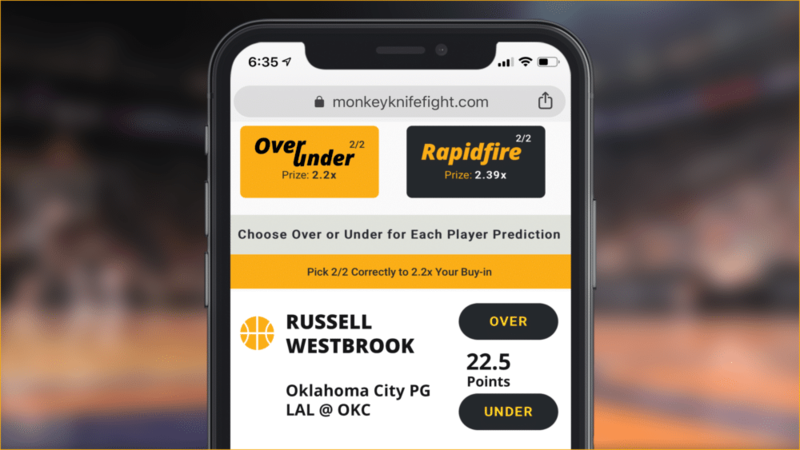 The Monkey Knife Fight platform was invented by owner Bill Asher and President Nic Sulsky, two fellow sports fans frustrated with DFS sites because of the levels of difficulty to play and how hard it is to win. Monkey Knife Fight combines the best of legal sports gaming with the best of irreverent sports culture. Users compete against the House or with friends to win real money from an array of easy to play sports contests. MKF offers a wide variety of real-money contests, with buy-ins ranging from $0 (freerolls) to $250. For users with $600 or more in net winnings for a calendar year, they require a valid mailing address and a social security number. For free accounts that have won money in a freeroll, bonus funds are ineligible to withdraw and MKF reserve the right to reclaim those funds. Sports fans play against the house with fun contests such as, “Will Bryce Harper have more than 2.5 total bases?”, “Who will have more RBIs and home runs on Thursday night: Mike Trout or Khris Davis?”, and “Will Chris Sale have more or less than 9.5 strikeouts? WHAT TYPES OF CONTESTS ARE OFFERED AT MONKEY KNIFE FIGHT? Stat Shootout – You will be choosing your team of players from the list that will accumulate the most of the stat type you have chosen to play, such as Touchdowns. Then choose a target goal for that stat and watch the players score live. If your team exceeds your chosen goal, you win the prize shown prior to entry. Rapid Fire – You will be selecting your team by choosing the highest scoring player in multiple head-to-head matchups in statistical categories. They will need to beat the unchosen players in their head-to-head matchups. If a player gets additional points added to their score in a matchup, they will be shown in green (ex: +14.5). Choose the coinciding posted number of matchups correctly to win the prize shown prior to entry. Over/Under – You will be selecting your team by choosing Over or Under for a group of player predictions presented. You will be squaring off with your own predictions. Choose the coinciding number of tiers correctly to win the prize shown prior to entry. WHO CAN PLAY AT MONKEY KNIFE FIGHT? You must be 18+ years of age and a resident of an approved US State (AK, AR, CA, CO, CT, DC, FL, IL, KS, KY, MA, MD, MI, MN, NE, NH, NM, NC, ND, OH, OK, OR, RI, SC, SD, TX, UT, VT, WV, WI, WY) to use Monkey Knife Fight. All registered users are required to supply identification information including your name, residential address, and date of birth. What does North America’s fastest-growing gaming platform do next? They quickly develop and launch on opening day, game enhancing MLB prop gaming expected to pay players more than $100 million in gaming during the 2019 baseball season. Hundreds of daily prop contests for every MLB game can be played right now at monkeyknifefight.com. Sports Techie followers and readers can sign up NOW and Monkey Knife Fight will instantly match up to $50 for the first deposit. Enter the promo code “MLB2019” upon joining. Sports Techie, real sports fans stand a chance to win real money since they’re playing against the MKF house – not ringers. Nic is located in Toronto, Canada. Asher is in Santa Barbara, CA. The rest of the company are located in San Jose. All products are built in-house in the United States. “After one year of testing the (sports tech) company took off after the Super Bowl,” said Nic. The team is working on an app right now. A Game of Thrones or Oscars freeroll might be in the works. For sure we will see MKF soccer soon with perhaps NASCAR around the corner. Bill and Nic have never met in person. The company name was born after a night drinking whiskey. You may have heard the term used before in an episode of the Simpsons. The rest is sports tech history.